Another day, another Impossible Burger! 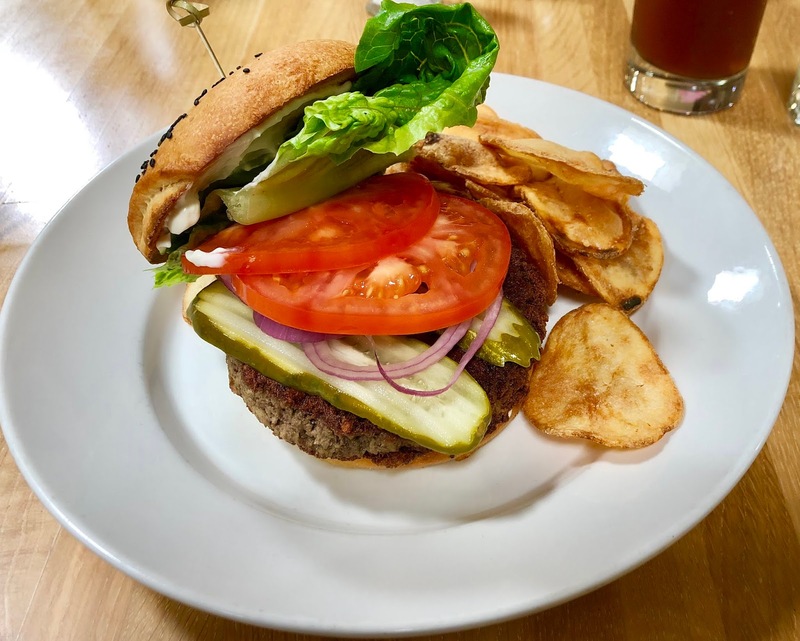 For today’s Great Sacramento Vegan Burger Battle meal, Phil and I had lunch at the Patriot in Carmichael, where they are serving two different versions of the Impossible Burger. The one with kimchi, ginger-soy glaze, ssamjang vegan mayo, and crispy onions sounded intriguing, but I wanted something a little more basic. I chose the Vegan Patriot, an Impossible Burger with lettuce, tomato, pickles, red onion, and vegan mayo on a sweet potato-sesame bun. Aside from the Impossible Burger, which was very good, the thing I liked best was the bun, which tasted very much like a soft pretzel and was quite delicious. The Patriot is located at 6241 Fair Oaks Boulevard in Carmichael, and their phone number is 916-550-5080. Their website address is https://www.patriotrestaurant.com/, and their Facebook page can be found at https://www.facebook.com/thepatriotrestaurant/. The restaurant is open for brunch and lunch daily from 10:00 a.m. to 3:00 p.m., for happy hour Monday through Friday from 3:00 p.m. to 6:00 p.m., and for dinner daily from 5:00 p.m. to 10:00 p.m.